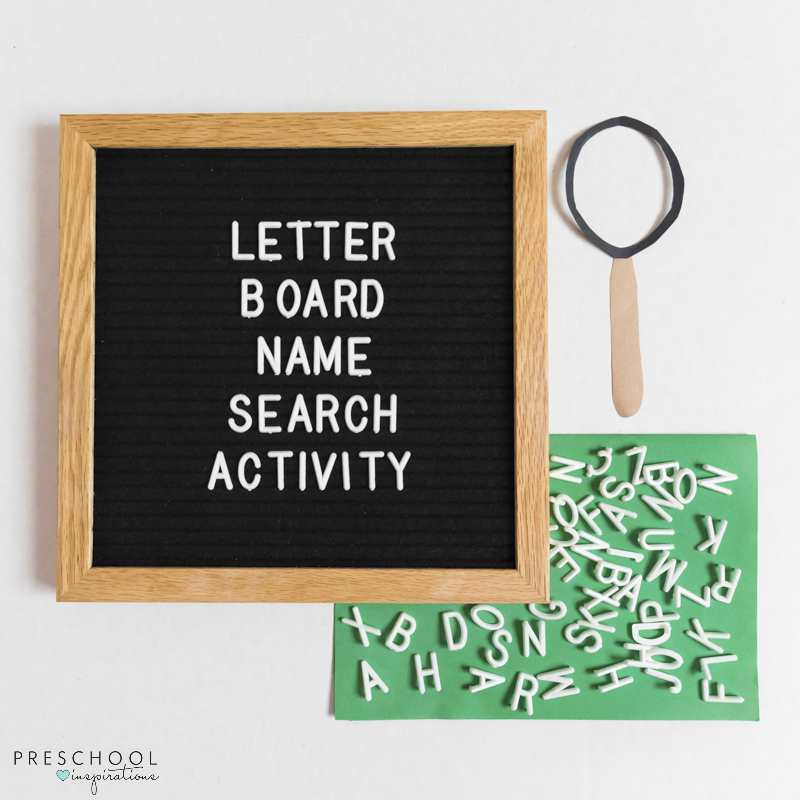 This letter board name search is a perfect alphabet activity to teach children to learn to spell their names. Have you joined the letter board craze? I absolutely have fallen in love with my felt letter board. I enjoy using it for milestone pictures, celebrating holidays, and even decorating my home with little quirky quotes. 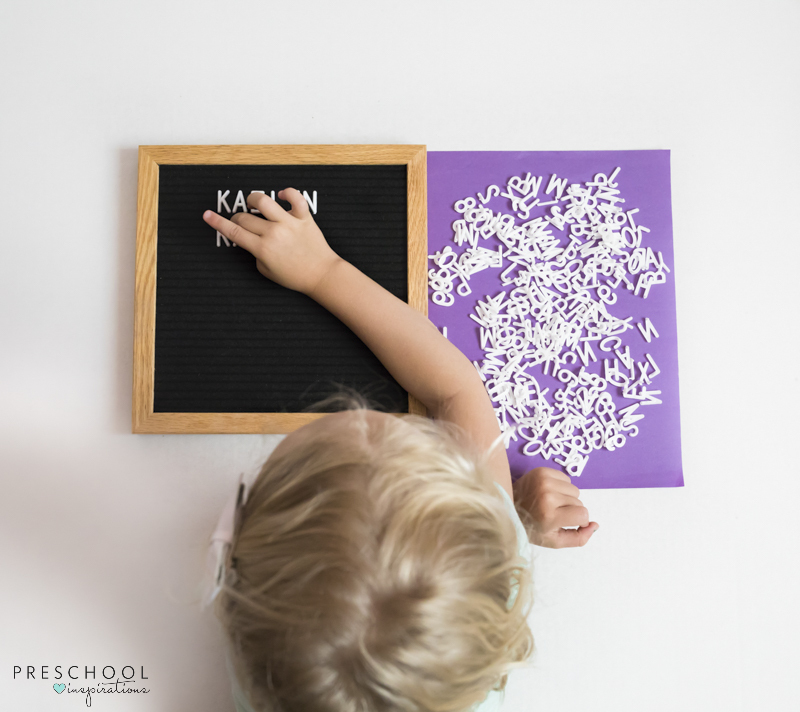 It wasn’t until one day I was searching through my pile of letters to collect the ones I needed, and my oldest daughter asked me if she could help, that it dawned on me that I could use my letter board as an activity for her! If you are anything like me, I love finding multiple uses for items, especially when it can be turned into a learning tool. I also find that to be money well-spent. Alas, the Letter Board Name Search was born! My daughter is at the age now where learning to spell her name is such a new and exciting thing. And I love that it is a perfect literacy activity that gets her excited about letters and the alphabet. So we decided to use this opportunity to practice spelling her name and learning the letters of the alphabet. She has spent many afternoons sitting with me at the kitchen table playing this while I get some time to get some work done. Win-win! This would also be a perfect literacy center activity in a classroom setting. 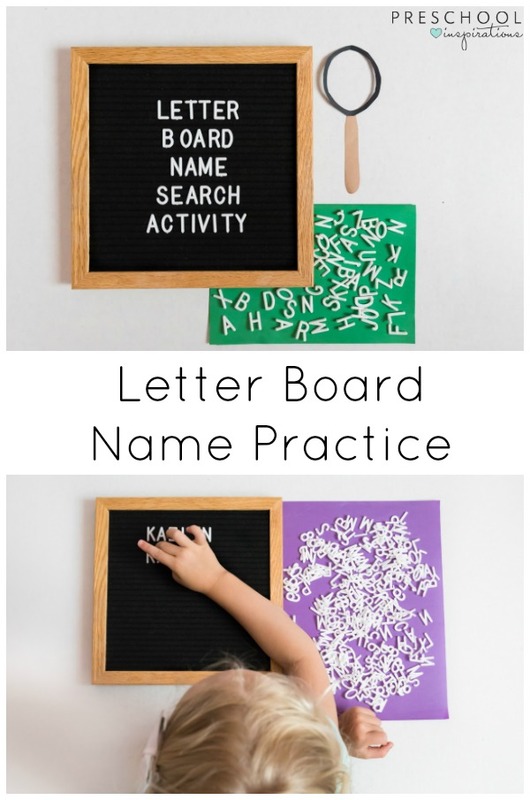 The steps to this are incredibly easy, and if you already have a letter board, your letters should already be detached from the plastic they come in. 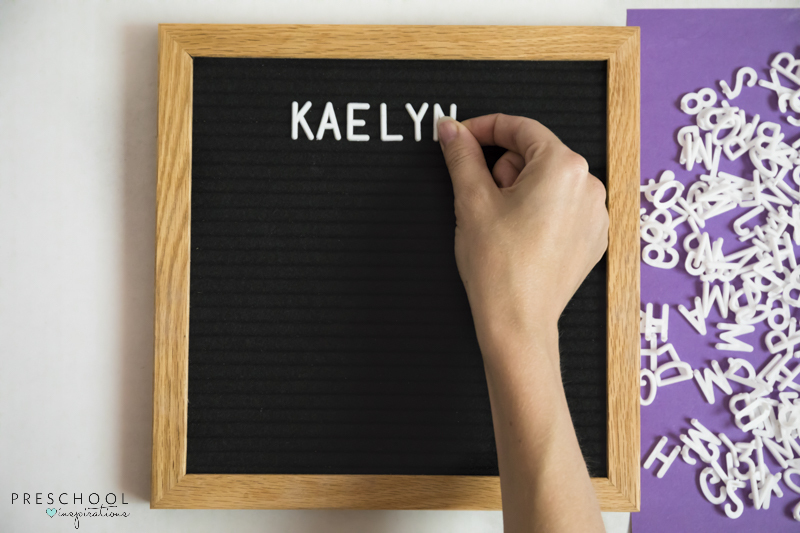 If you are new to the letter board world you just need to follow the directions and either cut or twist the letters off. You can find a letter board online or places like Target. First, I lay out the letter board and a couple heaping handfuls of letters. Next, together we search to find all the letters in her name and place them on the board. If your child is older and already knows how to spell their name, you can skip this step. I like to use this time to work on letter recognition and letter sounds. For example, when we pick up a letter that isn’t in her name, we say the letter sound. ‘S’ says ‘ssss.’ It’s a great pre-reading skill that will help as she learns to read. Once all your letters are on the board, I simply just have my daughter begin her search for the letters in her name. She then takes the letters that she finds and places them beneath the one we found together. This really challenges their attention, letter recognition, and fine motor skills as they have to pick up the small letters. We then moved on to spelling her middle name, and then finally her last name. After she was completely done, I would have her point to each letter and tell me which letter it was. She absolutely loves abc games. 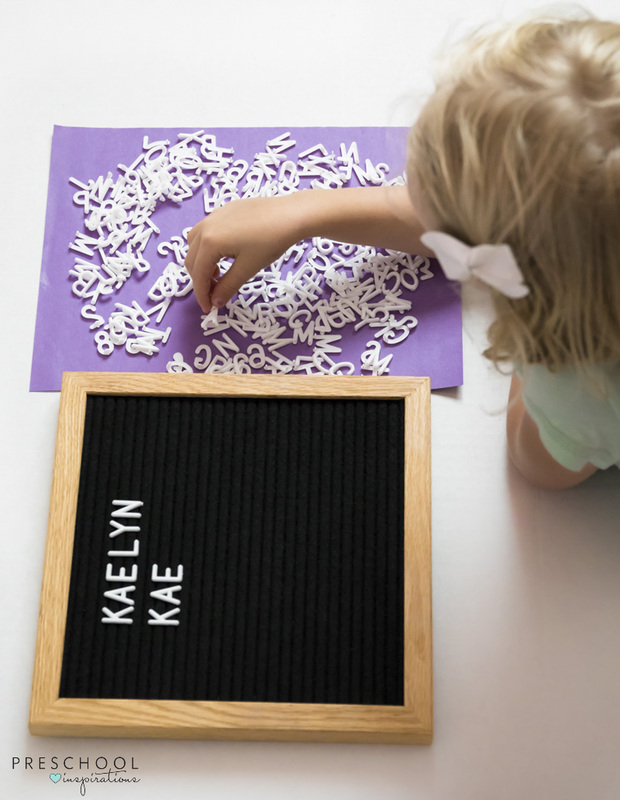 You can’t go wrong with felt letter board activities because there are so many possibilities, and you can cater it to all different age groups and comprehension levels. You can have them sort the letters alphabetically, have them find the alphabet, give them cards with words on them to find and spell, let them choose words to spell…the list goes on and on!! I really have enjoyed finding a new purpose for my letter board and having my daughter get excited about playing with it as well. Brittany is a mom to two beautiful daughters. She has studied Elementary Education and loves being her daughters' first teacher. You can find Brittany and their adventures on Instagram.